The Graymoor Spiritual Life Center is located on U.S. 9, 3.5 miles north of Annsville Circle in Peekskill. The address, for those using a GPS, is 1350 Route 9, Garrison, NY 10524. Those coming from the south can either come up U.S. 9 through Peekskill to Annsville Circle, located just north of Peekskill, or up the Taconic Parkway to either US 202 or US 6. From either exit of the Taconic, travel east toward Peekskill to the Bear Mountain Parkway. Take the Bear Mountain Parkway West until the intersection with U.S. 9. Turn right at this intersection to Annsville circle, and then follow U.S. 9 north for 3.5 miles to the entrance to Graymoor on the right, just south of the intersection with NY 403. Those coming from the east should take either U.S. 6 or U.S. 202 west to the Bear Mountain Parkway and follow the directions above. Those coming from the north should come south on U.S. 9 to the intersection with NY 403. 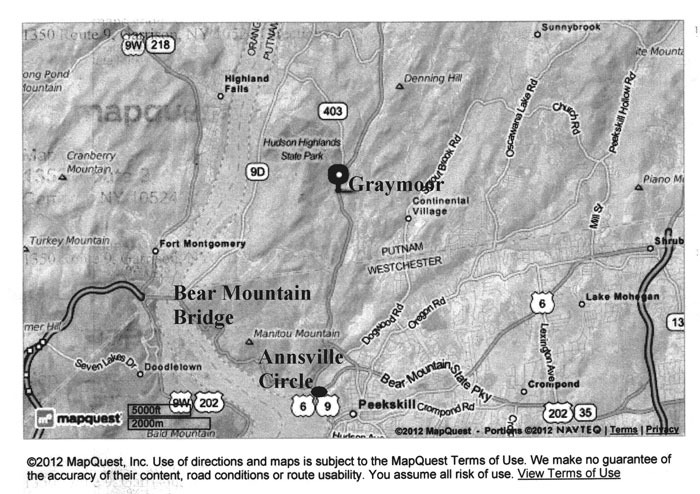 The entrance to Graymoor will be a sharp left hand turn approximately ¼ mile south of this intersection (there are other entrances which can be used from the north if you want to consult a map). Those coming from the west should take U.S. 6 to the Bear Mountain Bridge. Upon exiting the Bear Mountain Bridge make a left turn on to NY 9D. Take NY 9D north for 4.6 miles to the intersection with NY 403. Make a right turn on to NY 403 and continue to the intersection with U.S. 9. Make a right on to U.S. 9 south, and continue approximately ¼ mile south to a sharp left turn into the entrance to Graymoor. Graymoor is a large, multi-building facility covering many acres. Tres Dias weekends are held in the Spiritual Life Center at Graymoor. Upon entering the Graymoor grounds from U.S. 9 according to the directions above, continue up the hill past several turnoffs until, near the top of the mountain, you see the 7-story Spiritual Life Center on your left (building 21 on the accompanying map of the Graymoor grounds, after the Driving map). 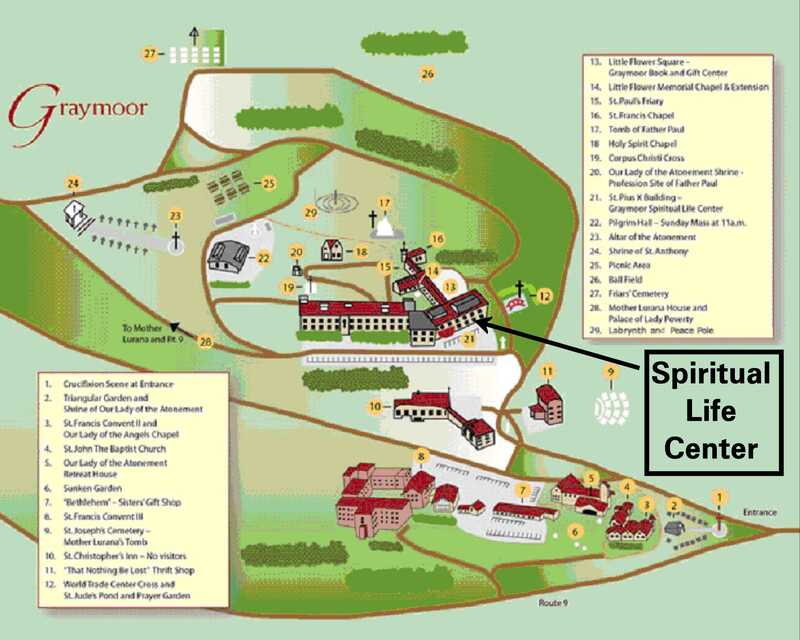 Turn left at the sign for the Spiritual Life Center into the parking area and enter the building though the entrance facing you. Short term visitors can park in this parking area. Those who are staying for the weekend will be given directions to longer term parking areas once they have dropped off their luggage. You will need to check in at the reception desk at the entrance to the Spiritual Life Center. 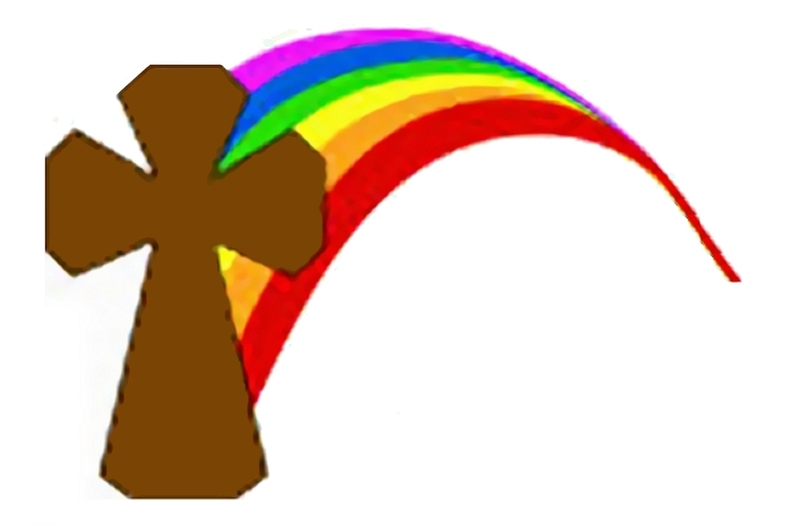 From there you will be directed to your destination within the Spiritual Life Center.